FROM THE LAB: Our next Modular 101 and Maths classes are starting soon, Join Us!! 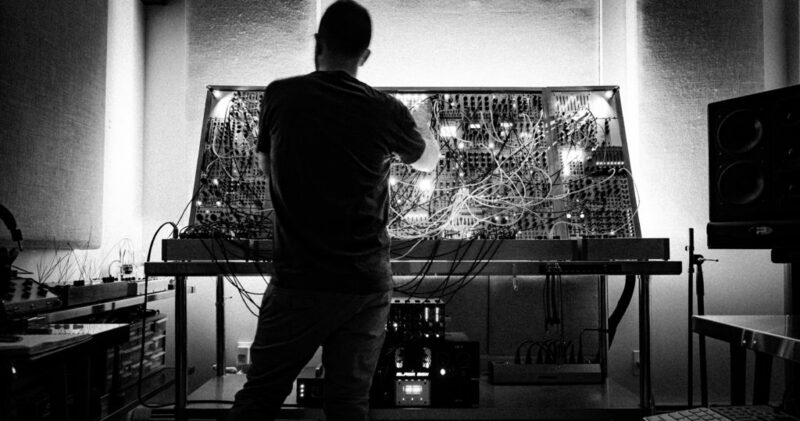 Last week saw the release of a new record “System” from Datach’i, an experimental electronic music artist who has captivated the modular community with his intricate Eurorack music videos in recent months. Datach’i, whose last record was released 10 years ago on Sublight (in good company with Richard Devine, Venetian Snares, Bong Ra and others on the label), carved out a place for himself in the IDM world, so it’s great to see him back with such an incredible showing. “System” is being released on TimeSig, Venetian Snares label, and is a full return to the pre-Dubstep days of the late 90s and early 2000s IDM. Datach’i was clever enough to consider the importance of video performance in the modular scene as well, recording a video for each track on the recording, some of which have been slowly leaking out through his Youtube channel for the past many months. VCL: What attracted you to Eurorack, and how did you first get introduced to the format? What were you working with before you built your system? JF: I was originally attracted to Eurorack as a way to generate original source material for my post production sound design projects. I got introduced to the format through my friends Richard Devine and Josh Kay in 2009 who at the time, were posting lots of videos of their modular explorations. As far as the gear side of my musical history goes- I had originally started making electronic music in 1996 and from then until 2000 was all hardware based with some MIDI control via an old Mac Centris 650 running Digital Performer. By 2001 i was entirely working in the computer though about 2006 with Cubase, DP, Reaktor, Super Collider, Pro Tools, etc. From 2006-2011 I didn’t make any music at all really as I was bored with creating music on the computer, plus I was quite busy starting up my own sound design company Jafbox sound. As my system grew, modular really sparked music making again for me. I love the whole process of creation with these systems. There’s a sense of collaboration with the machine, almost as if it’s alive, and a feel of non-permanence that really inspires me working with modular. I like to think of it as a bit of artificial intelligence, a collaborator in music making. VCL: Why make an all modular record? JF: It wasn’t something I set out to do as a challange. It’s that I only make music on the modular these days as that is what inspires me so that’s what lead to the all modular album. There’s something really satisfying working with a self contained system. It also forces you to be creative and develop new processes to achieve certain ideas that come inherently when limiting yourself to working within set parameters. VCL: Your videos often only include you, personally, for a moment, to engage the performance in the system… Why is that? VCL: Which modules in the system are most important to you? JF: There’s no one module that’s more important than the other for me, it’s more the system as a whole and how the different modules interact. I mean, of course there’s always a set few that may inspire more then others, but then there’s those others that become necessary pieces of the puzzle that you only really appreciate when you are in a certain stage of a patch. A special thank you to Joseph Fraioli for speaking with us!!! Join us tomorrow for our live streaming interactive series, Additive Voices, with special guest Icaro Ferre of Spektro Audio!